thanks to all contributing activists! 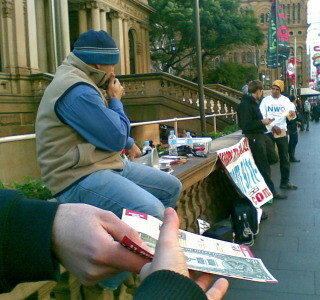 Posted: Thu Jun 11, 2009 10:33 am Post subject: Sydney 11th of June Action Report! 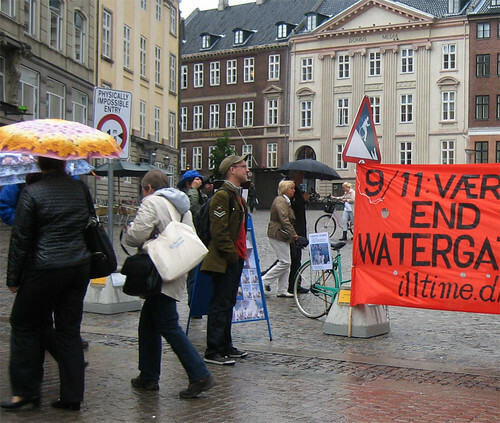 Thanks to Maria for this excellent video clip of our Truth Action on the 11th of June! 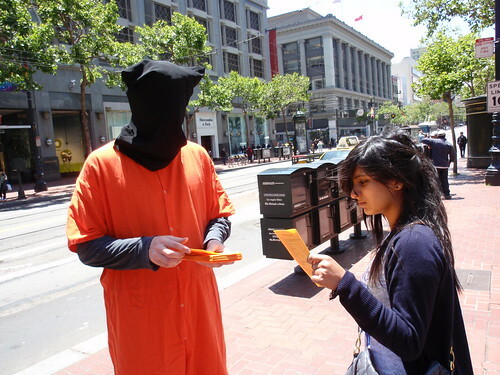 During the day we had over ten activist present passing out hundreds of fliers and DVDs to the community over 5 hours. Please join us next time on the 11th of July if you can...it will make you feel better about the state of of world and hopeful of change! 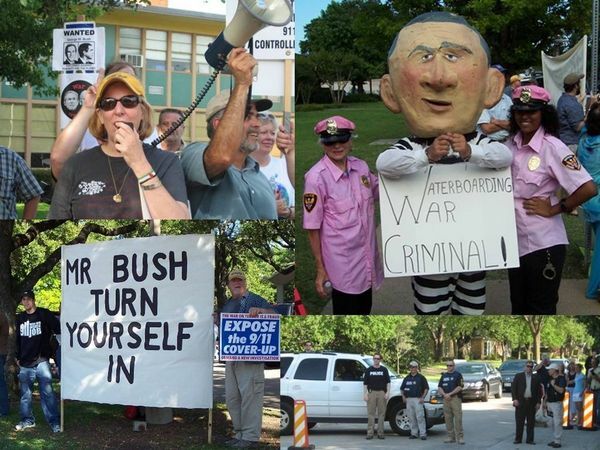 Always adamant in nonviolent and peaceful demonstrations, "North Texans for 9/11 Truth" joined Cindy Sheehan, Code Pink, The Dallas Peace Center, and other concerned citizens in a march and protest to the home neighborhood of George W Bush in Dallas, Texas. 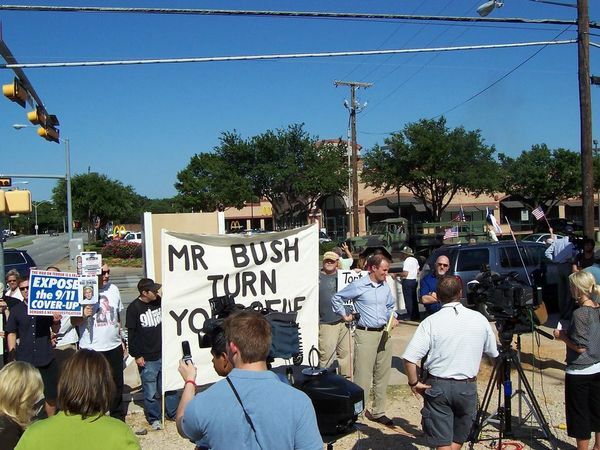 Monday, June 8 2009, was a hot, humid 5pm afternoon as marchers walked several miles during rush hour traffic. 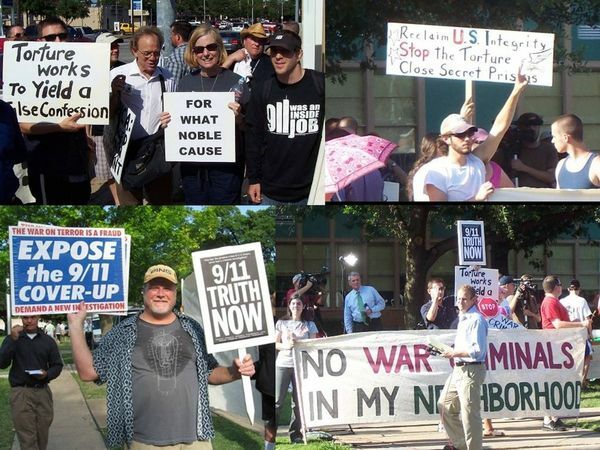 Despite the sweat and heat, as always, this was a civil, peacable monthly 9/11 Truth Action which "North Texans for 9/11 Truth" performs around the 11th of every month. 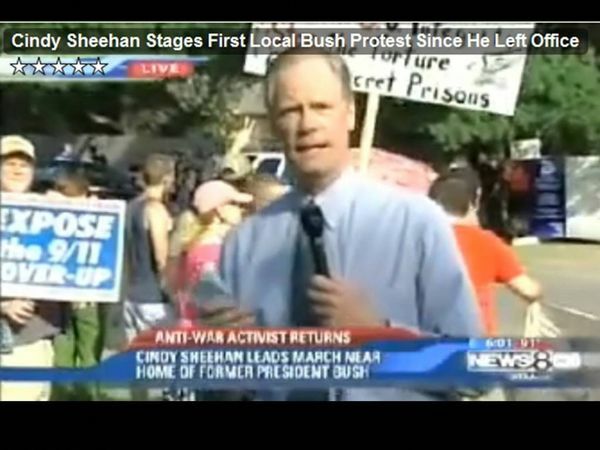 In this 6 minute video, Cindy Sheehan delivers a powerful speech in front of the street leading to Bushâ€™s home. Some very profound statements are made â€“ points which we all should make note of. 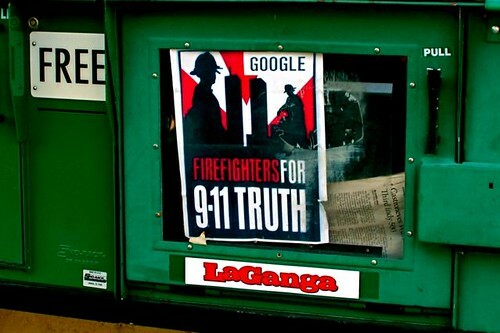 9/11 Truth also gained exposure during the TV NEWS. As you can see, there was a lot of Press. 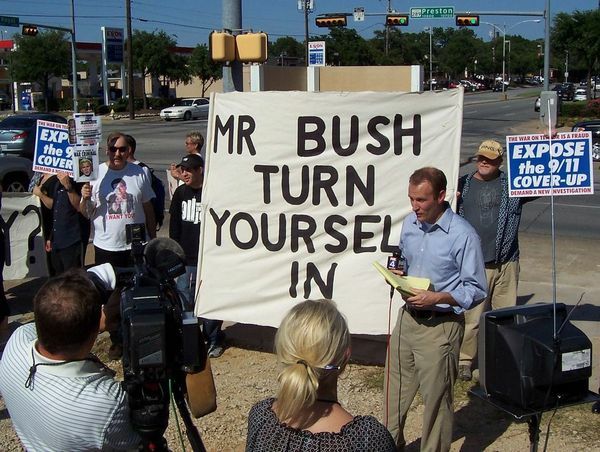 WFAA Channel 8 ABC (which also owns The Dallas Morning News) happened to forward the message of 9/11 Truth in their news broadcast. There are also two other YouTube videos which have raw footage of the march. "the raw story" picked up Video #1 and ran it with an excerpt from The Dallas Morning News. Cindy Sheehan's tenacity and compassion is something we should all emulate. It is up to each one of us, as individuals, to take an active role in changing this nation and the globe with 9/11 Truth. 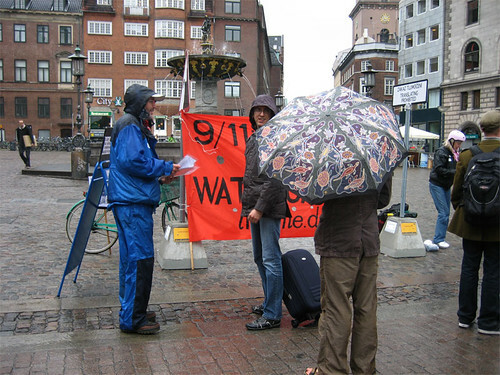 9/11 Truth is the primary tool in order to end the wars and to bring about justice. The site is live NOW! Check it out and join us! 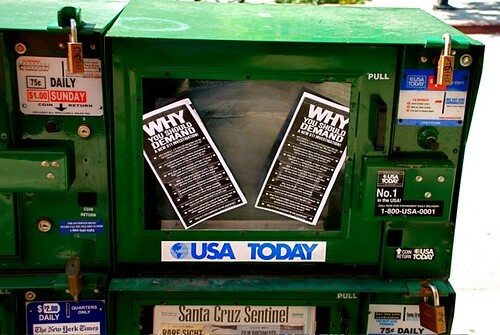 Help build an independent media locally! and consider joining us at a street action! 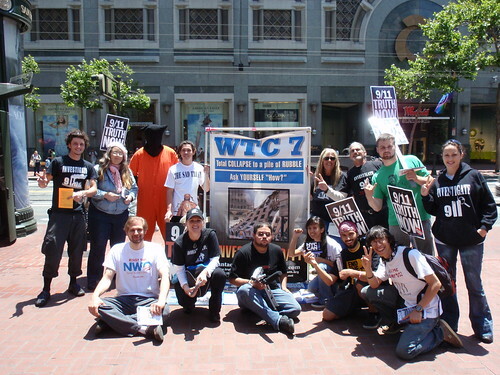 WeAreCHANGE is the Coalition for Halting the Agenda of the Nefarious Global Elite, a citizen's activist group whose principles are non-violence, educational outreach, and networking based on mutual benefit/respect. 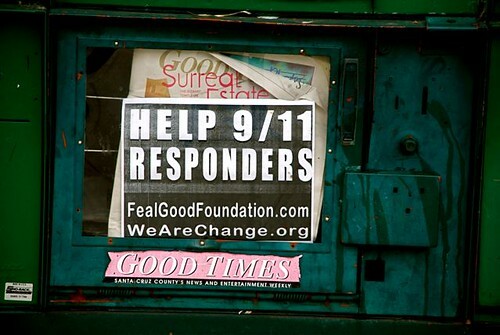 Join Jersey City Peace Movement, JC911Truth, NJ WeAreCHANGE and other activists at the 9/11 memorial fountain in Journal Square on the last Sunday of each month to donate food/clothing to the homeless and hand out free information and media (CDs, DVDs) to passersby. We only got the one photo this month. I passed the camera off to one of our truthers and she ended up getting caught in an hour long conversation with one guy. We had a new truther join us this month. A tattoo artist from London England named Nick. Very nice guy and he handled himself pretty well with a stack of discs. 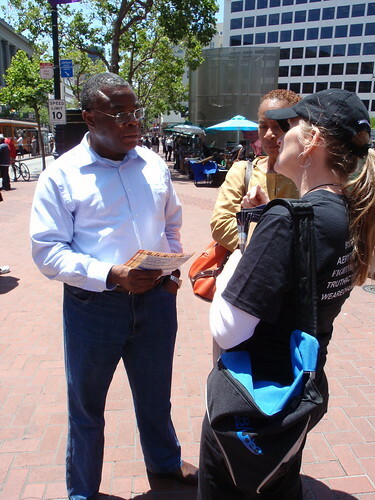 He jumped right in there and started doing outreach. Summer has finally arrived in Ottawa! It was hot and sweaty and we all loved it! Next month is on a Saturday and we're going to BLUESFEST! It's nice to see the Ottawa gang without jackets on! Great turnout this 11th - 20+ activists, lots of new people, great reception, good times! It was pouring today, and I am continually amazed at the dedication to getting the truth out and to being on the streets on the 11th of every month - in the snow, rain, sunshine ... whatever. 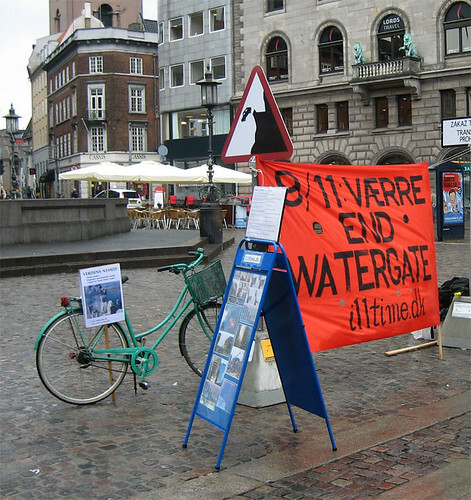 We were 9 people out there on "Gammeltorv" in Copenhagen. Here are some photos from our day. Thomas from our group is great at teaching school kids - on one photo there is a school class - he explains about building 7 and free fall speed, the temperature steel has to be to melt etc. More and more people are waking up every day. 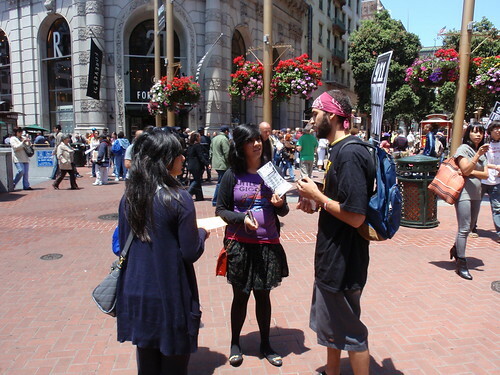 We had an amazing response this month to our ongoing efforts to bring the 11th of every month a Truth message. 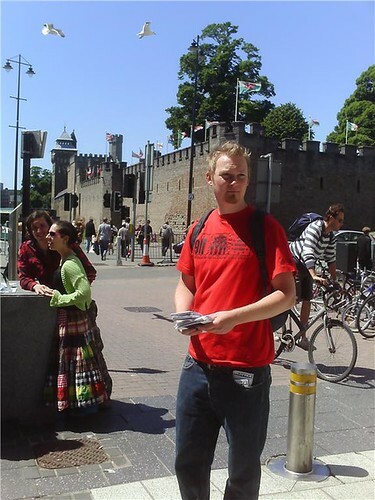 Huge thanks to Cardiff S.W.A.T for their support, bringing new blood into the We are change Wales movement. 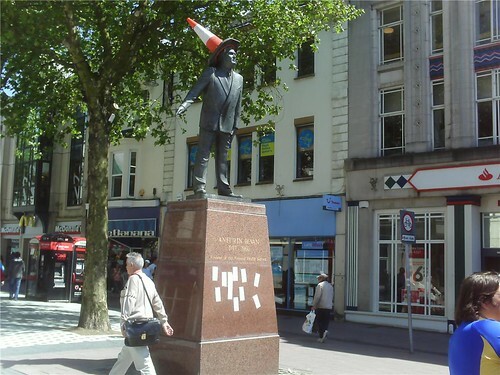 The 11th of the month is held worldwide as a moment to reflect on the murder of almost 3000 people by the criminal global crime syndicate that has taken over the world, and we in Wales are also showing our respect for this by engaging the people of Cardiff to raise awareness about the official fairy tale of 9-11, and the problems with the emerging global new world order. 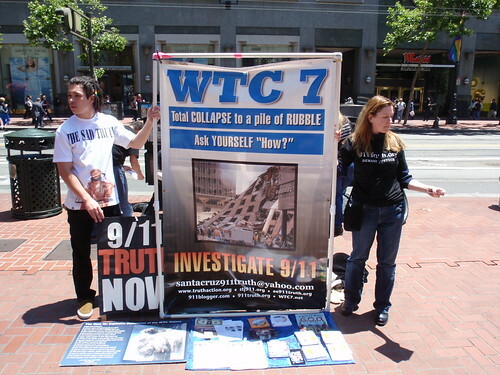 I will bring over 100 DVDs and leaflets to give out and spark a debate about 9-11 Truth, and also to help grow this site to affect more change and reach more people. If not now then when, if not us then who? We are being raped right now by the global banking elite, no issue can be seen in isolation, and all pieces of the puzzle must be put together to expose the new world order's diabolical plan to do nothing less than enslave us, our children, and our children's children. This will be our 2nd 11th and need as many people as possible to come, bring DVD's (loose change etc) and 9/11 flyers, we have to inform the masses and go viral with 9/11 truth. 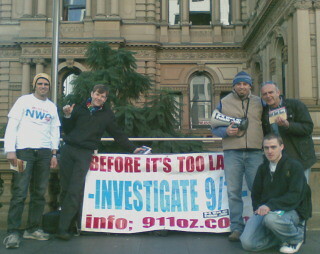 A few of us here from Cincinnati 9/11 Truth gathered at Fountain Square in the heart of downtown Cincinnati yesterday for about 90 minutes for our June 11 street action. 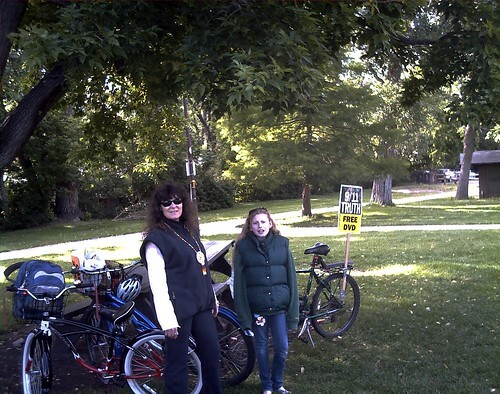 Although Cincinnati generally is an extremely conservative area we had a great response to our presence. 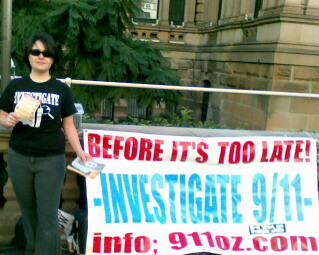 We stood on the corner facing traffic and held up our AE911Truth banner and handed out flyers and some dvds. 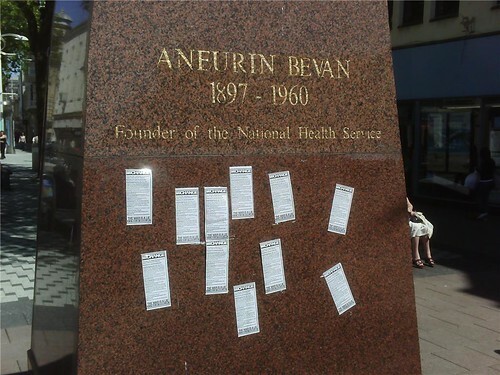 Yesterdays' public response was the most positive and gratifying that we've experienced up to this point in time. 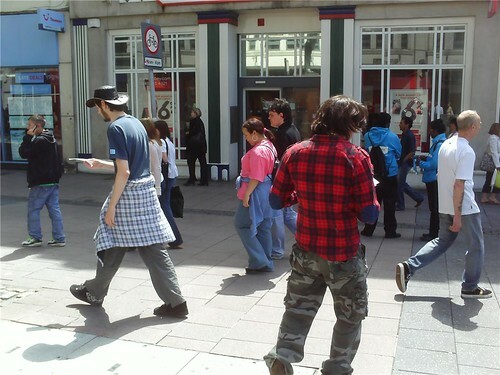 We actually had people intentionally crossing the street to come over and speak with us and to take flyers. I mentioned the upcoming NYCCAN ballot initiative to several people and they were extremely supportive of it. There truly is 'something in the air'. 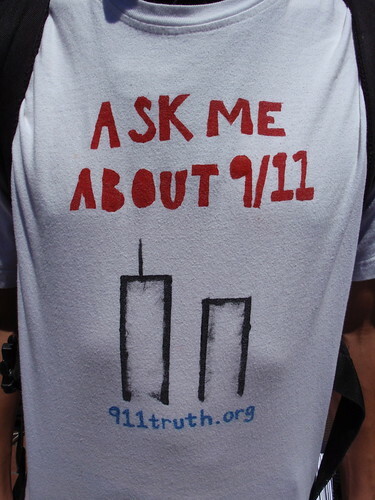 More and more people are aware of the 9/11 inconsistencies and are quite curious to know more. Right as I began handing out flyers to people on Fountain Square the first words out of this older African American woman's mouth was "Did they ever figure out who put those bombs in the building?" 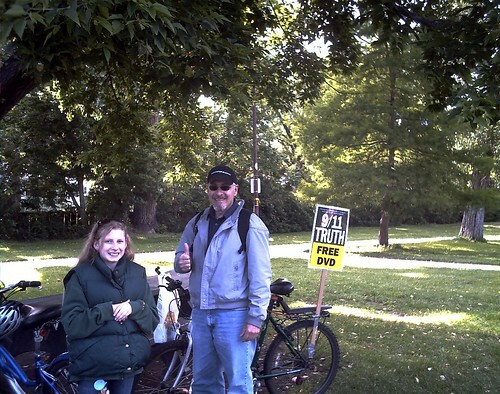 June 11, 2009 : Four 9/11 truth activists for the first time banner this heavy traffic location, safely located on an Island between 3 busy through-ways. All located in front of the Alberta Legislature. A brain storm idea from JD of Calgary 9/11 Truth. 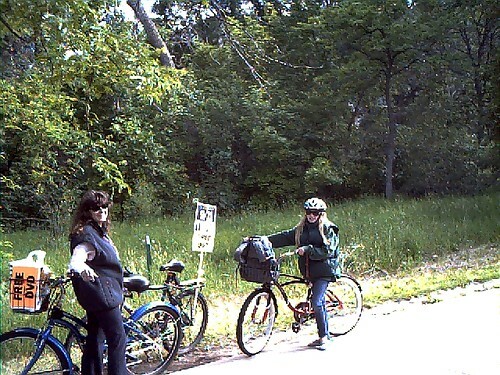 Rainy weather hampered our ride - not many folks were in the park where we started. We had better luck handing out DVDs on Pearl St. and on the way home. 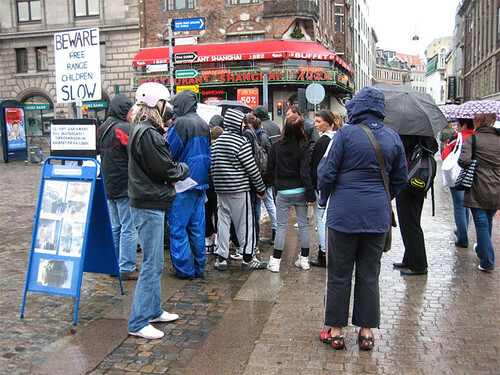 We went through downtown and stopped near outdoor eating establishments - people saw the sign and asked for DVDs. 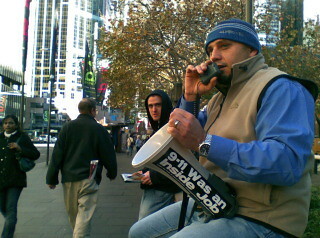 Regardless, it was fun and I think we discovered a new method of spreading 9/11 Truth. 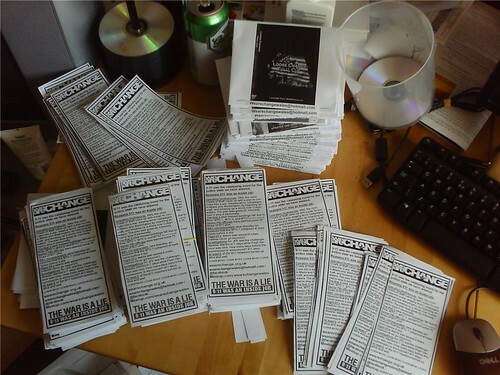 "We passed out about 500 DVD's in about 6 hours and we also passed out hundreds of flyers created by Architects & Engineers For 9/11 Truth."